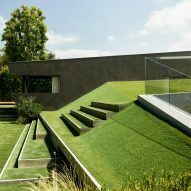 California studio Eric Rosen Architects has carved away parts of a sloped site to make way for a multi-level home topped with a grass-covered roof. 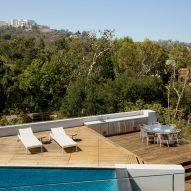 The Barrington Residence is located on a hillside in LA's upscale Brentwood neighbourhood. 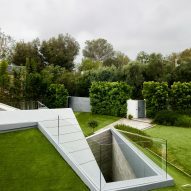 The dwelling replaces an older home that had dark interiors and limited views of the surrounding terrain, according to Eric Rosen, who leads an eponymous studio in Culver City. The only parts of the former structure that were kept were a retaining wall and a pool shell. 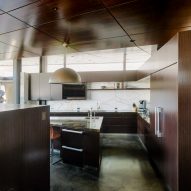 Designed for a couple and their two children, the new dwelling takes its lead from the site and context, along with the client's desire for indoor-outdoor living opportunities afforded by the pleasant climate in southern California. 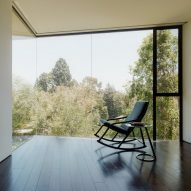 The architect was also influenced by the 1970s conceptual artist Gordon Matta-Clark – specifically his film and performative piece Splitting, which involved cutting in half an old house in New Jersey with a chainsaw. 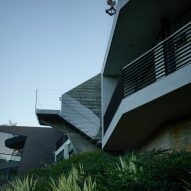 The three-storey Barrington Residence, which is roughly Z-shaped in plan, consists of a series of polygons embedded in the sloped site. 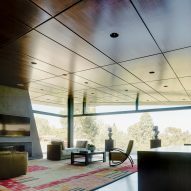 The dwelling was envisioned as "cascading planes" that contrast with a large mass – a pool house – on the north side of the property. 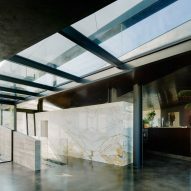 The home's upper level encompasses public spaces, while the middle level contains bedrooms and a den. The lowest floor houses a storage area and a playroom. 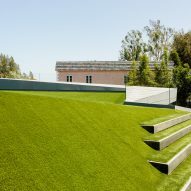 The front elevation features steps leading up to grass-covered roof, which enables views of the Richard Meier-designed Getty Museum perched on a hilltop to the north. 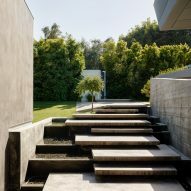 To the south of the steps, Rosen cut a "slice" into the sloped site and organised various volumes around this incision. 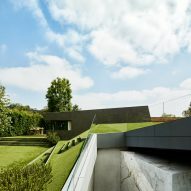 In the front of the home, the slice takes the form of a walkway leading to the primary entrance. 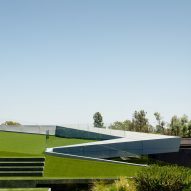 "The first gesture was to slice into the descending slope to create an entry to the main-level spaces," the architect said. 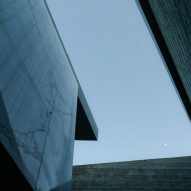 "This slice begins outside with a series of offset concrete landings floating over a babbling water-feature and adjacent to a large board-formed concrete retaining wall." 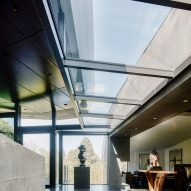 The pathway leads into the home's top level, where one arrives in a foyer with floor-to-ceiling windows and a glass ceiling. This level contains a kitchen, a dining area, a family room and a living room with a bar. 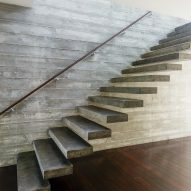 The slice continues downward in the form of a stairwell with cantilevering concrete treads. 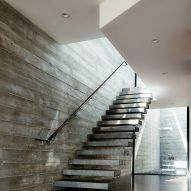 The stairs end at a den, which is flanked by the master suite on one side, and by the children's bedrooms on the other. 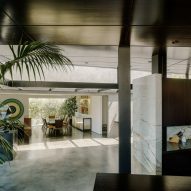 Jutting off to the west of the den is an angular volume that contains guest quarters. 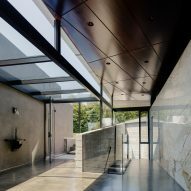 Outdoor spaces, including a swimming pool, were incorporated throughout the residence. 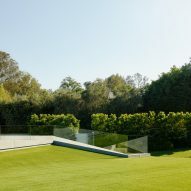 The pool house sits atop the land, in contrast with the sunken character of the rest of the home. 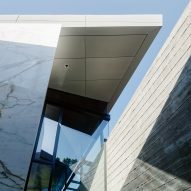 "The pool house rises from the ground like a displaced mass, becoming an anchor to a series of ascending and descending planes," the architect said. "These planes become a series of interior and exterior habitable spaces giving access to and enhancing the experience of the overall site." 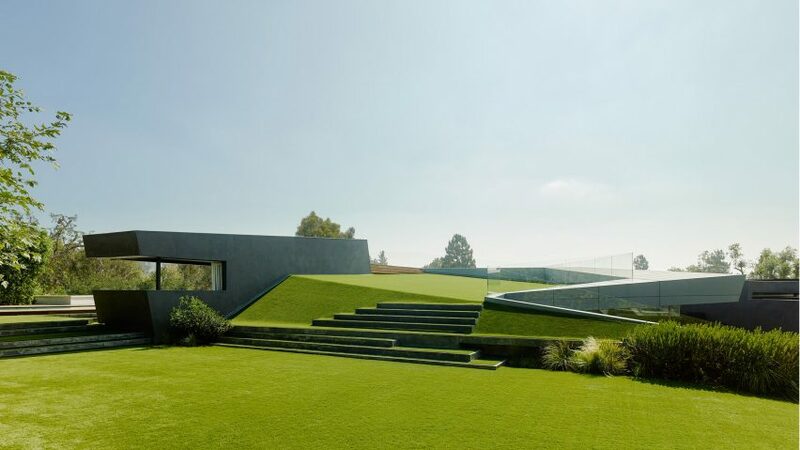 Los Angeles has long been a place for experimental residential design. 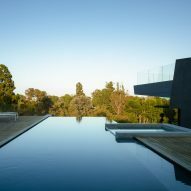 Other notable projects in the area include a minimalist house in Hollywood by Fran Silvestre Arquitectos that juts out from a hillside, and a dwelling by Mario Romano with a rippling aluminium skin that was inspired by ocean waves.